I’d have made a very bad historian. That’s a surprising admission, perhaps, for a writer whose plots are grounded in English history, but I’m much more interested in the lives of ordinary people that are caught up in great events than I am in the events themselves. Talk to me about how the generals manouevred to win a battle, and my eyes will glaze fairly rapidly. Show me a private soldier’s letters home and I’m hooked. It’s history on a human scale. This week, I visited Haddon Hall in Derbyshire while researching my next book. If you like old English manor houses, and haven’t been to Haddon Hall, then I can thoroughly recommend a visit. Unlike so much of our architectural history, it has survived relatively unscathed through every threat from the English Civil War to the concrete catastrophes of the late 20th century, and is now being lovingly restored by the same family that has owned the place for about eight hundred years. But if you go, allow some time to look Westwards, towards the cow pastures on the opposite slopes of this beautiful valley. The turf carries the imprint of a road, rising towards the skyline. Hummocks in the hillside show where dwellings once stood. The discerning eye, I’m told, can see the outline of enclosures for cattle. This is Nether Haddon, mentioned in the Domesday Book of 1086 and in 13th century documents, but at some time in the Middle Ages, the village disappeared. English Heritage (who list Nether Haddon as an Ancient Monument) speculate that the decline might have begun with famines or the Black Death of the fourteenth century, or even the creation of a deer park by the lord of the manor in 1330. But these forgotten people left their mark. Even after seven hundred years, the strip patterns of medieval fields still flow across the hillsides above; regular, gentle undulations of the ground like the slow-breathing waves of the deep ocean. They also left their mark in Haddon Hall, whose chapel was their parish church. See if you can sit there alone, in between the guided tours. It is small enough for the aisle to seem crowded when a party of fifteen washes into the space, flowing round the box stalls and monuments, their heads turning in unison at the intonation of their guide, but each flood soon recedes. Wait a while. The atmosphere seeps back into the chapel the way a mouse will creep back into a room it thinks is empty. Sit still, be aware, smell the centuries. They decorated their church, the people of Nether Haddon. The walls are covered in their wall paintings, probably dating from the early 15th century. Entire walls are decorated in leaf designs and stories from the lives of saints . Enough people had survived for this still to be a living church, and their exquisite artistry lasted until the Reformation. Did I say ‘survived relatively unscathed’? God save us from zealots of all faiths, and the desecration that they do in His name. 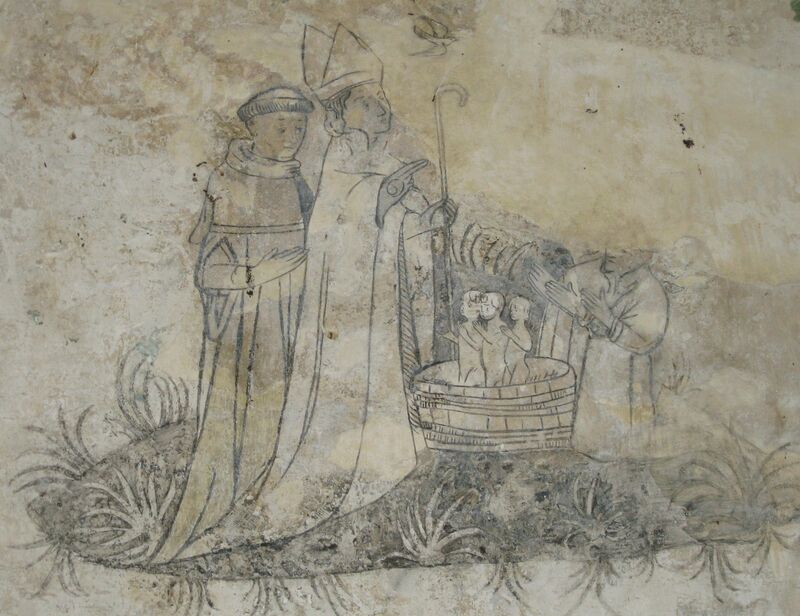 After the English church broke with Rome, the wall paintings were plastered and lime-washed over. Only now are they being restored, and only to pale suggestions of their former richness. But still, there’s a link. A road to nowhere between old earthworks, a strip piled into a ridge by an ox-drawn plough, and a simple faith that painted miracles into plaster. There’s a story in there, somewhere. Thanks, Ben. I’ll take a look.